On-form Ghanaian striker Jordan Ayew has emerged the third most fouled player in the 2017/2018 season. 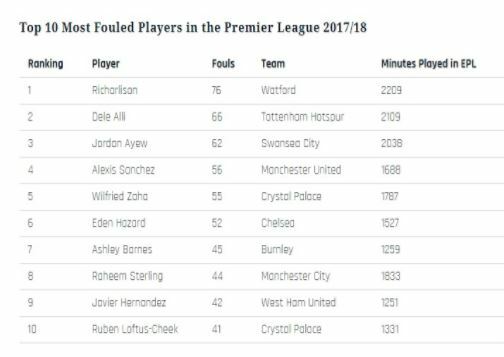 Ayew, has been fouled 62 times in 2038 minutes behind Watford's Brazilian wonder kid Richarlison (who has been fouled 76 times in 2209) and England and Tottenham Hotspur midfielder Dele Alli (who has drawn 66 fouls in 2109). The Ghanaian started the season as a second striker often playing behind Chelsea loanee Tammy Abraham and Wilfried Bony but the arrival of Spaniard Carlos Carvalhal as Swansea boss has seen him thrust into the centre-forward role where he has found form. Ayew, 26, has scored five goals and recorded two assists in 23 appearances for Swansea in the English Premier League, with all his goals coming in his last ten games. The pacey Black Stars player has become a livewire for the Welsh side in the ongoing relegation dogfight using his pace and sharp movement around the penalty area to draw fouls for Swansea. Manchester United's Alexis Sanchez placed fourth while Chelsea's Eden Hazard and Manchester City's Raheem Sterling placed sixth and eighth respectively.